When we found ourselves in the Akron area recently, we needed help finding a place to eat dinner. Twitter flooded me with options, and "R" and I headed towards Luigi's Restaurant. However, the parking lot was packed, and the line was out the door at 8:00pm on a Friday. It was a chilly night, so I had no interest in standing outside to wait for a table. On to Plan B. A friend had suggested the Diamond Grille, if we were in the mood for a classic steakhouse. We had driven right past it, not too far from Luigi's, so that quickly became our destination. I was hungry hangry! To be honest, from the outside, I thought that it looked like gentleman's club. The glass-block windows, neon sign, questionable surroundings...it didn't quite look like the fine dining experience that it really is. That was half the fun! Once you enter the building (free, small parking lot in back of the restaurant), you are transported back in time. The restaurant opened in 1941, and it probably hasn't changed one bit since then. Wood everywhere, white linen tablecloths, a big, heavy menu...it felt classically old-timey and like a steakhouse should feel. The menu isn't huge, but there's something for everyone. A few appetizers and salads to start, and then entrees from The Broiler, Fresh Fish Daily, Seafood, Chicken, and Specialties. "When in Rome"....I focused right in on the steaks. Normally, menus list the ounces for each steak option. Shame on me for not asking, but I ordered the Royal Filet Mignon ($37.50) because the Filet Mignon was described as "for the delicate appetite" on the menu. We weren't ordering any appetizers or additional sides, and the steak only comes with one potato side and a salad. As I mentioned, it was much later than we would have liked to be eating, and I was very hungry at this point. However, I was not expecting this giant cut of meat to arrive. It was like two filets in one! I had to take half of it home with me. Again, shame on me for not asking, but I do wish that the menu listed the weight of the steaks. Diners have a choice of salad and choice of potato with an entrée. 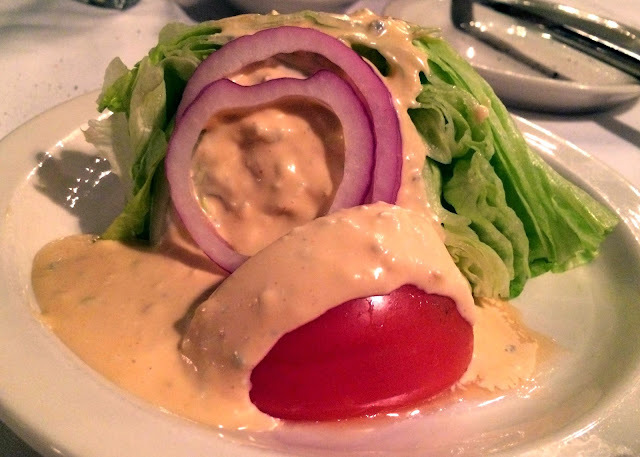 The Tossed Diamond Salad that comes with an entrée order was quite pathetic, from the looks of it at other tables. So, I decided to get the Head Lettuce with blue cheese salad. It was nothing special, but certainly fine. Now, I had asked for the steak to be cooked "medium-rare" but it arrived much closer to "rare" than I'd care for. I really didn't want to wait for them to re-fire it, so I just ate the thinner section and around the edges. 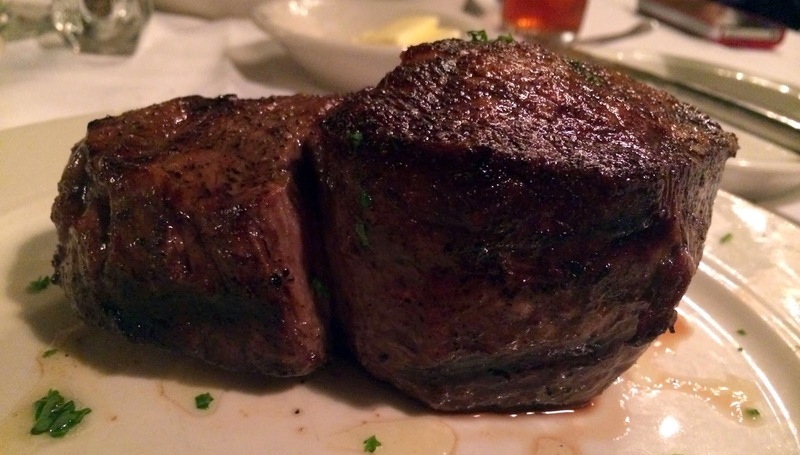 With the two different thicknesses of meat on this one filet, it had to be difficult to cook it to the desired temperature. Also, it was under-seasoned, and a little more salt and pepper would have gone a long way. The real disaster was the Baked Potato that I selected as my side. It was woefully undercooked. Dare I say raw? No amount of butter and sour cream could save this potato, and I just left it. "R" ordered the broiled Atlantic Salmon. The fish tasted fresh and was cooked well, but it was unmemorable in flavor and a tad too high in price ($29.50). 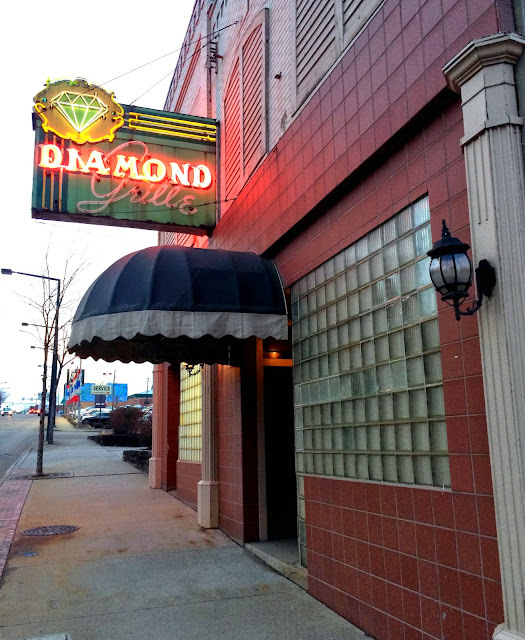 The Diamond Grille is a CASH ONLY restaurant, which is rare these days. It is even rarer when it comes to fine-dining. Diners can pay by cash (no ATM on site), check, or they will mail you a bill. Yes, you read that correctly. You can give them your contact information, and they will MAIL YOU A BILL. Unheard of. I'm still dumbfounded. I do suggest that they put a sign up on the door, stating that they are cash-only, or they should consider having an ATM on site. "R" had to leave me at the restaurant to drive up the street to a bank. Awkward. The co-workers dining next to us didn't realize that it was cash-only until the guy went to pay the bill and then his female co-worker had to write a personal check to cover the meal. Awkward. There is a small box announcing the cash-only status on the inside of the menu, but I feel like this could be easily overlooked. So, in summary...it was a charming place with quite a bit of character from the inside and out. However, for the high price tag ($12 Shrimp Cocktail for 4 shrimp???) and inconsistent quality of food during our meal, it just wasn't worth it, in my opinion. 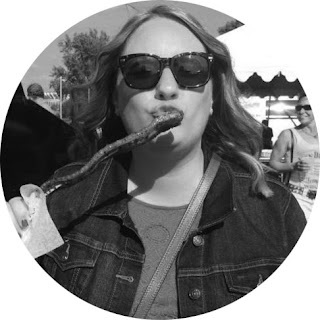 I left feeling like we paid an arm and a leg for an average meal at a steakhouse, that included some missteps with the food. Did we just experience an "off" night there? Have you been? I have to say, I was coveting the Scallops that a woman was enjoying at the table next to ours. Five (maybe six?) large sea scallops for $23. However, they appeared to be served on a piece of standard toast. Odd...maybe worth investigating? I have seen this many times and also thought it looked like a seedy place from the Prohibition era. LOL. Luigi's is cash only too...what's with that? But you are right, down in these parts is is "legendary." We felt similarly about Peter Luger's in Brooklyn...heard so much about it, but we were ultimately underwhelmed.